Facebook Messenger seems to be getting more features every week, and now two more have been added to the incredibly popular app that will make sharing content and taking part in video chats easier. While accessing a smartphone’s gallery to share images and videos with friends on Messenger is simple, you have to perform a few more steps if this media is held in Dropbox. But now, the cloud storage service has been integrated into Messenger on both the Android and iOS platforms. 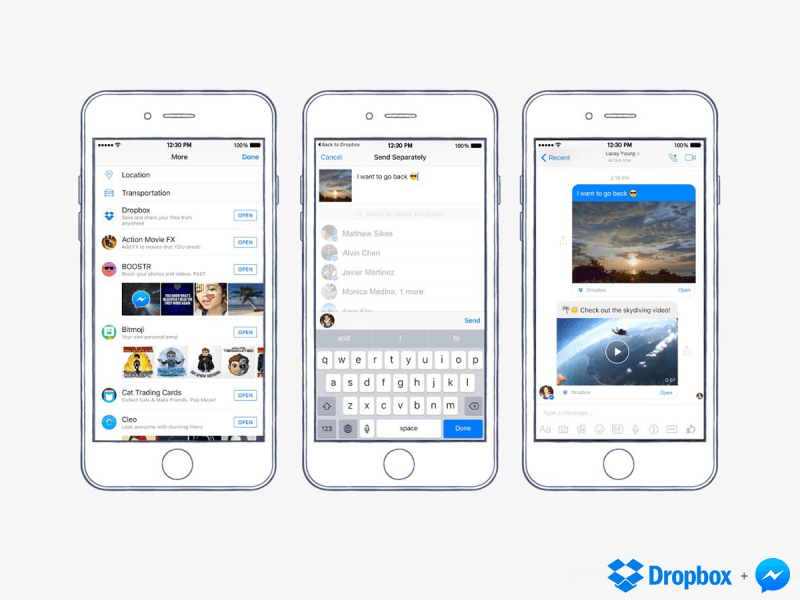 As long as you have both apps on your phone, Messenger users will be able to hit the ‘More’ button in a conversation and directly share photos, videos, and GIFs stored in Dropbox. Sharing anything else, such as PDFs, will send the recipient a link that takes them to the Dropbox app where they can preview and save the files. You can download Facebook Messenger for Android here and Dropbox for Android here. "We want people to communicate just the way they want to on Messenger, with everyone they care about," said Stan Chudnovsky, Facebook's head of product for Messenger. "Giving our users the ability to share their Dropbox videos and images in Messenger threads with just a few taps will help them bring more style and personality to those conversations." The second new feature gives users the option to conduct video chats using a smaller chat head rather than the full phone screen. On Android, this means you'll be able to take part in videos chats while using other apps, but on iOS the feature is restricted to inside Messenger itself. Facebook said it is rolling out both features over the next few days. Expect more new Messenger functions to be revealed at Facebook's F8 developer conference, which is taking place today and tomorrow.